We joined a CSA this year. This is one week's share. What the hell does one do with swiss chard? Thank God for google recipe searches. I guess garlic makes it good. Find a local CSA near you. Swiss chard: Use it in place of spinach in pasta recipes. Just make sure to cook it a little longer–the stems are good, but can be tough if not cooked long enough. Or make chard burritos (with black beans and jack cheese). I love, love, love chard and so do my kids. Pull the leaves off the stems and cut any grungy bits off the stems. (You can also slice thick pieces thinner.) Put about an inch of water in a biggish pot with a generous dash of soy sauce. Put in the stems, cover the pot, and cook at medium heat for ten minutes or until the stems are tender. Then add the leaves and cook another five minutes. Drain everything and dress it with a mixture of vinegar and soy sauce. We saute it with Italian Sausage (out of the casing), garlic and chili pepper flakes and serve it over pasta. YUM> Just be sure to clean it well and get rid of the lower-middle center stems, they can be rather tough. Chard is good chopped fine and cooking into lentil soup (although kale is better). Lots of greens are good cooked this way: saute briefly in olive oil with garlic, add a bit of broth or water to the pan, cover and simmer until tender, then serve with a light dressing of rice wine vinegar, salt, and pepper. Basically the same thing as Maria D but with balsamic vinegar instead of soy and some dried cherries or craisins. Maybe sautee some shallots before you add the chard. Yum! Awesome guys. I really love the idea of the sausage on the swiss chard, but I really love sausage. Saute onions and garlic, chop up the chard and saute it for a bit, and then add it to pasta with feta and parmesan. I served this to my greens-averse father who concluded that if you put enough cheese in a dish, anything can taste great. if you put enough cheese in a dish, anything can taste great. Except cottage cheese, which cannot be made to taste good. Mmm swiss chard. Saute garlic and red peppers. Add swiss chard. Toss with pasta, balsamic and parm. Elizabeth David (in Italian Food) has a recipe for Cavoli in Agrodolce which works for any heavy greens (including Chard). Saute some onion until soft, add tomatoes, let them cook down a little. Add the Greens (with the thickest veins cut out), stir til coated, then add vinegar. Simmer for 20 minutes or so, until the Greens have softened. Add some sugar. Stir it in and simmer another five minutes. 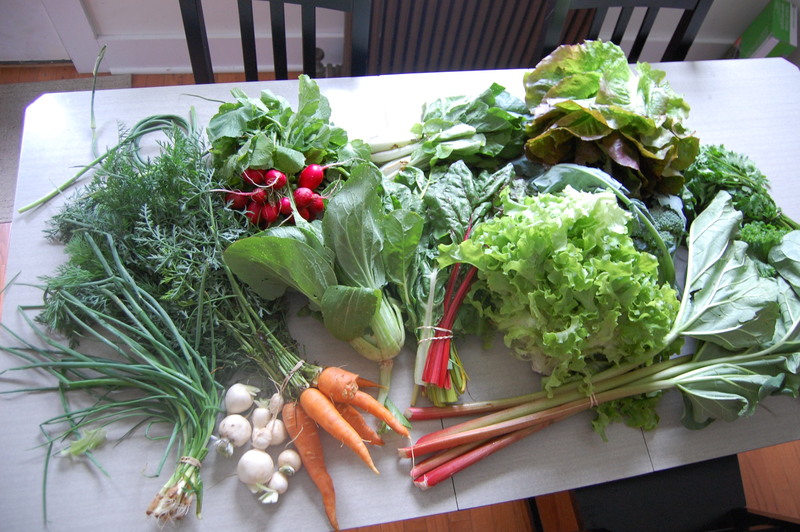 We belonged to a CSA for three seasons. We dropped it because it was too inflexible and there’s a good farmers’ market here. I guess I don’t have to add another Swiss chard recipe. I just made some yesterday, harvesting our raised bed. I love my raised bed. I think I should start a FB fan page, or something. Jim, that sounds very yummy. I would recommend, though, to saute the stems first, then add the tomatoes and then the leaves 0 the cook times of the stems are not to be underrated. I made this sans tomatoes and it was great with whole wheat spaghetti. Afterwards I thought, hm, maybe add tomatoes? And some balsamic vinegar? Oh, food! I love food. You made me a bit curious, so I looked around, I think I have two partial answers. Also, these British gardeners suggest that the reason for the traditional practice is to enable the rhubarb plant to recover by the following year. Rhubarb shouldn’t be eaten after June 20th, 1957. Don’t knock rhubarb. Instead, go make the rhubarb sorbet recipe on Epicurious, because it is easy and also amazing. Isn’t rhubarb pie with vanilla ice cream pretty good? I know there are also recipes for strawberry rhubarb pies and such. I have had good rhubarb pie and, while I don’t know specific recipes off the top of my head, the general gist is always to pair rhubarb with something that tastes good to make a good pie. I’m with MH. I’ve never understood the need to eat rhubarb if you’re just going to have to douse it in sugar and strawberries to make it taste good. I dislike the strawberry/rhubarb combo: it tastes like kool-aid. Plain rhubarb pie is excellent, and so is blueberry-rhubarb. Rhubarb with crystallized ginger is also a great combination.